After the excellent film I Dream In Another Language helped me shatter my unsuspected prejudice about films made in other countries, I was in the perfect frame of mind to watch White Sun. 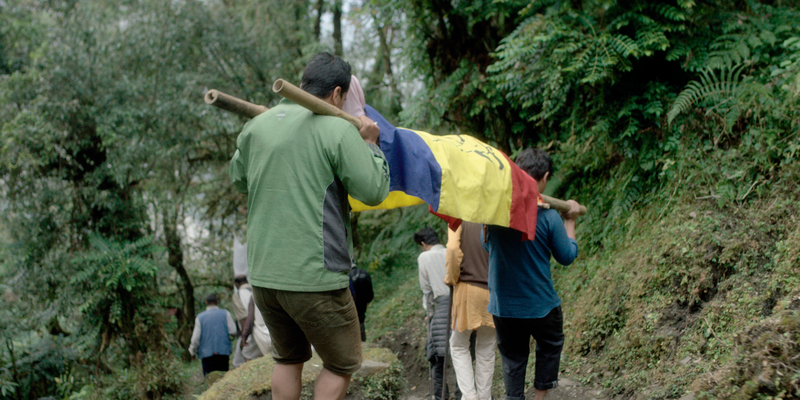 Set in a remote Nepalese village, this movie tells the tale of a man who just came back from joining the Maoists in their civil war against the Royalists. He comes to the village to bury his recently deceased father. But first, he must encounter his brother, who was on the opposite side of the war, along with the village elders who hold fast to the traditional, misogynistic ways of their Hindu ancestry. To complicate matters, his ex-wife is also present and wants him to sign paternity papers for a young girl who is not his daughter. Without his signature, the archaic laws of this society will not permit her to attend school. As this tale unfolds in a very personal way, it provides an allegorical backdrop that perfectly mirrors the struggles of an entire country attempting to accept a new constitution which, as a compromise, does not seem to appeal to anyone. It takes the tolerance and wisdom of a very young boy and girl to help these individuals face their ingrained prejudices and find a path forward. The entire movie is shot on location with a breathtaking backdrop of the Nepalese countryside. Moment by moment, exceptional cinematography and excellent directing move this exhilarating story forward. The script offers great diversity as multiple characters represent different sides of a national conflict. And the actors live up to the challenge, portraying their characters with depth and skill. The lucky FFF filmgoers who saw this movie were not only treated to an intimate look at a remote country but also an allegory of humanity that can be a beacon of hope for all of us during troubled times. To make it even better, Mrs. LanceAround, NumberTwoSon and I notice about eight people wearing shirts that say Nepal. We discover that they are a group of Nepalese who live in the Orlando area. They agree to give us an interview after the film. Don’t miss my blog post tomorrow where these Nepalese share their experiences growing up in Nepal and compare it to the movie we just watched. It’s a fabulous experience that can only happen at the Florida Film Festival! This entry was posted on May 15, 2017 at 10:31 am and is filed under Art Community. You can follow any responses to this entry through the RSS 2.0 feed. You can leave a response, or trackback from your own site.